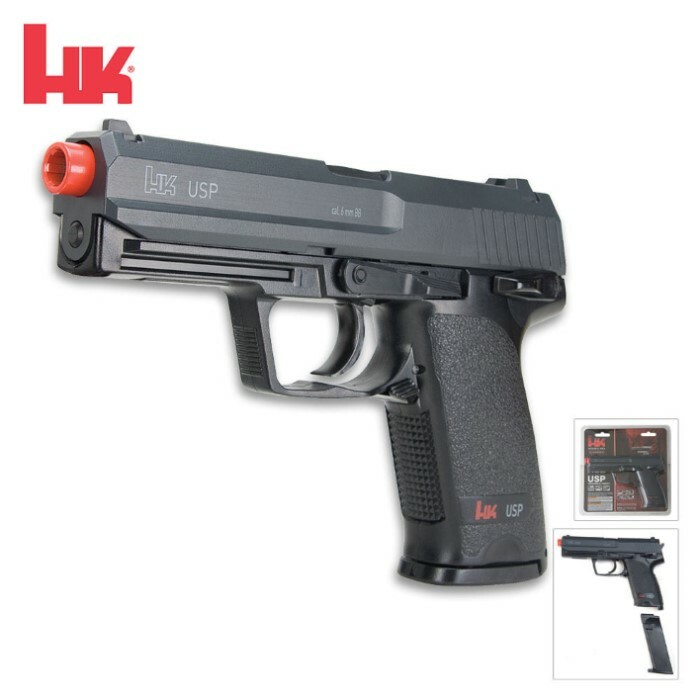 Heckler & Koch USP Spring Airsoft Pistol | BUDK.com - Knives & Swords At The Lowest Prices! The Heckler and Koch USP Spring Airsoft Pistol is one of the hottest sidearms on the market today. In classic black finish, this gun is a replica of a real Heckler and Koch pistol, and features semi automatic firing, a 25-round heavy magazine, and a shot velocity of 240 fps (using 6mm BBs). The pistol also comes with an integrated Weaver accessory rail, giving airsoft enthusiasts the ability to mount optional sights. Had time to do some target practice and this is a wonderful purchase. The KH USP airsoft makes for great target practice in my garage. From one end to the other it is quiet accurate. The gun has a very nice feel in the hand and is not too light...in other words it does not feel cheap. Great purchase for the price. Everything the description says is true. Incredibly durable, semi-auto Handgun with great accuracy, I highly recommend this!